My card of the week for October 4-10, 2015 is the 2014 Topps Stadium Club Sonny Gray Rainbow Foil Autograph. This card is number 04/50. 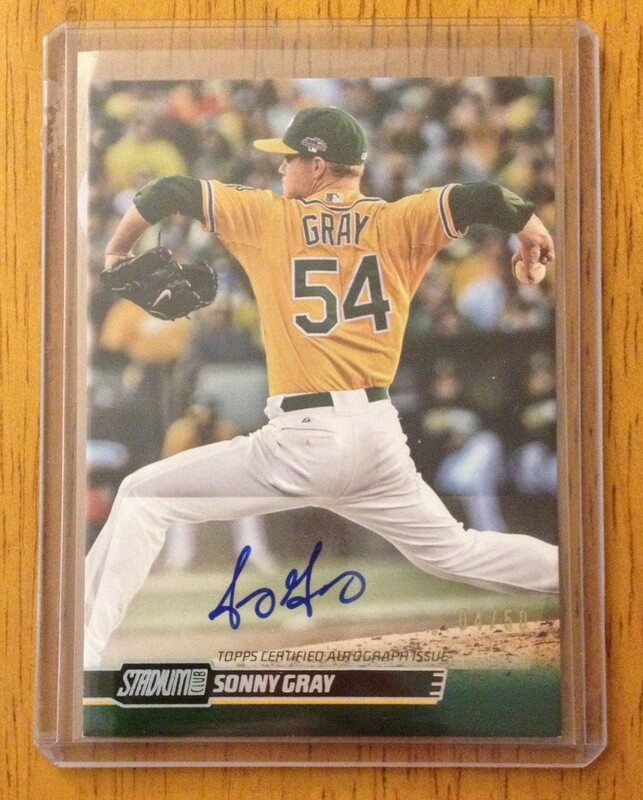 Until this summer, I did not own any Sonny Gray autographed cards. 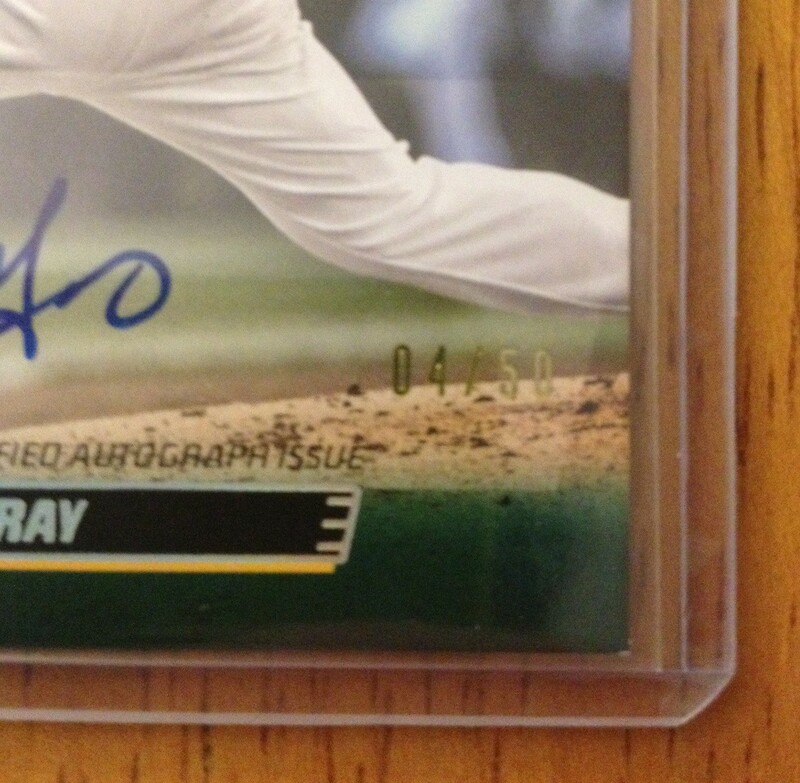 This card is now my 3rd Sonny Gray autographed card. I have always loved Topps Stadium Club. It is one of a few sets where the photography takes center stage. This particular photo appears to have been taken during the 2013 ALDS. That year Sonny pitched in Games 2 & 5 of the series. Both of those games took place in Oakland. Here is an up close picture of the gold foil stamped number. The Oakland Athletics select 3B Matt Chapman in the 1st round of the 2014 First Year Player Draft. Chapman, the 25th overall pick, comes out of Cal State Fullerton. He is the first college player drafted by the Athletics with their first pick since Sonny Gray in 2011. Chapman was ranked by MLB.com as the 82nd top prospect entering the draft. In 2014 for the Titans he batted .312 with 16 2B, 6 HR and 48 RBI in 54 games. The Oakland Athletics will have on more pick this evening. They will have the 65th overall pick, a round 2 selection. The beginning of April brings the beginning of the baseball season. The season actually started, in full, on March 31st, but that’s close enough. The Oakland Athletics dropped the season opener by a score of 2-0 to the Cleveland Indians. The 2 runs came in the top of the 9th inning off the new closer Jim Johnson. So far in this young season the Athletics have had 2 games postponed. 1 due to rain and the other due to unplayable infield conditions. The rain out was made up the next day as a part of a split double header. No make up date for the second postponement has been announced at this time. It has been quite an interesting first week for the green and gold. The first week wraps up tomorrow as the Athletics take on the Seattle Mariners. Sonny Gray (0-0, 0.00 ERA) will face off against Erasmo Ramirez (1-0, 2.57 ERA). Sony was the Opening Night starter and pitched 6 strong innings striking out 7 receiving a no decision. With all of these posts about the current Top 20 Prospects in the Oakland Athletics organization, I wanted to look back at the same list only from the 2013 preseason. We will talk about those who graduated from the list and those who have dropped off. Here is the Top 20 Prospects list coming into the 2013 Spring Training. When comparing this list to the current list 7 players have moved off the list. 3 players have graduated from the list and 4 players fell off. Dan Straily – After a strong rookie debut in August and September 2012, Straily was given another opportunity to show he belongs in the majors as a member of the Athletics’s starting staff. Dan made the starting rotation on Opening Day in place of Bartolo Colon who was finishing up a 50 game suspension from the 2012 season. After Brett Anderson went down with an injury Straily made the case and remained in the starting rotation for the remainder of the season. Grant Green – Grant was called up right around the 2013 All-Star Break and made his MLB debut with the Oakland Athletics. His tenure was uneventful and short lived. At the trade deadline Grant was traded to the Los Angeles Angels for Alberto Callaspo, a move that ultimately helped both clubs. Grant found his stroke and started to get plenty of playing time proving that he does belong in the Majors. Sonny Gray – Sonny was called up around the same time as Grant Green and the results were the polar opposite. He excelled in 2 relief appearances prior to making his 1st MLB start. One of the memorable moments from the 2013 season for Sonny was his 1st Postseason battle vs. Justin Verlander of the Detroit Tigers. Gray matched him pitch for pitch with the Athletics winning the game in walk-off fashion in the 9th inning. Michael Taylor – The aging minor league veteran has dropped off the list due to inconsistent results at the Major League level. Taylor is a proven hitter in the Minors, however that success has yet to translate to the Majors and with the crowded outfield situation in Oakland he may be better suited to hookup with another organization. Bruce Maxwell – With the trade of Max Stassi in the 2012 off season Bruce became the Athletics’s top catching prospect, and at this point he still is. Bruce may have dropped off the list, but he did not fall far. In his 1st full season Bruce batted .275 earning a promotion from Class A to High A ball halfway through the season. Bruce is not only a force at the plate, but behind the plate as well. He handles a variety of pitchers very well and is quickly becoming a great game caller. Beau Taylor – After Bruce Maxwell, Beau was the other catcher on the Top Prospect list. He excelled in the 2012 season advancing 3 levels, Vermont Lake Monsters to Stockton Ports to Midland RockHounds in a short time. Beau had a difficult year at the plate hitting only .191 in 76 games. His defense behind the plate is what keeps him ranked as a Top Prospect, but just not in the Top 20. With a strong 2014 Beau could return to the Top 20 list. Jefry Marte – Acquired by the Athletics in December 2012 from the New York Mets, Jefry was quickly labeled as a Top 20 Prospect. He had a strong showing in 2013 batting .278 with 17 doubles in 66 games for the RockHounds, but with the new Draft Class and stellar performance from some unlikely players, Marte dropped off the Top 20 list. The Oakland Athletics wrapped up the regular season on Sunday with a decisive 9-0 victory over the Seattle Mariners. The Athletics finish the season with a record of 96-66. Sonny Gray took the hill and pitched 5 strong innings giving up only 3 hits while striking out 8. Sonny wraps up his first year with a record of 5-3, 67 strikeouts in 64 innings and a 2.67 ERA. The offense was led by Seth Smith who was 3 for 5 with 2 doubles and an RBI. Daric Barton also drove in a couple for runs on a single in the Top of the 5th inning. The Athletics will have 4 days off before the start of the Postseason. They will set their sights on the Detroit Tigers in the ALDS starting on Friday, October 4th. All signs point to Bartolo Colon (18-6, 2.65 ERA) as the Game 1 starter. This will be the 2nd year in a row that the Athletics will face the Tigers in the ALDS. Oakland Athletics 2013 AL West Champions! In the bottom of the 3rd inning the news came across the Oakland Coliseum that Justin Maxwell of the Kansas City Royals hit a game winning grand slam against the Texas Rangers securing for the Athletics the division title. By that time the Athletics were already leading the Minnesota Twins by the score of 6-1. The Athletics would go on to win the game 11-7 completing a 4-game sweep of the Twins and finishing up the 2013 home season. Sonny Gray (4-3, 2.90 ERA) pitched 5 strong innings securing his 4th win of the season. Sonny allowed 4 runs while striking out 3 batters. The offensive onslaught was lead by Coco Crisp who went 2 for 4 with 4 RBIs. Coco hit his 22nd home run and stole his 20th base today reaching the 20/20 mark for the first time in his career. Oswaldo Arcia was trying to play the spoiler today for the Twins. Oswaldo went 3 for 4 driving in 6 of the Twins 7 runs. This is his 1st season in the majors and he is batting .254 with 14 home runs. The 22-year-old Arcia could be a force to be reckoned with in the years to come. Evan Scribner came in to pitch the 9th inning. After giving up 2 runs, Evan struck out Josmil Pinto to end the game and begin the celebration of the division title. Congratulations to the Oakland Athletics on being the American League West Division Champions for the 2nd year in a row! Before the game began on Tuesday night the Athletics knew they would receive no help from the Tampa Bay Rays. The Texas Rangers beat the Rays 7-1. So in order for the Athletics to reduce the magic number they would have to take matters into their own hands. This is not always an easy task against the Angels. Athletics/Angels games are always competitive. The two teams seem to rise to the occasion and Tuesday night was no exception. On Thursday the Oakland Athletics wrapped up a successful start to their road trip. The Athletics, led by A.J. Griffin, won by a score of 8-2 over the Minnesota Twins. Griffin picked up his 14th win of the season as he went 7 innings allowing only 1 run on 2 hits while striking out out 8 batters. A.J. is now 14-9 with a 3.81 ERA. The offense was led by Josh Reddick who is returning from a wrist injury that sidelined him for about 2 weeks. Josh slammed a 2 run home run in the 8th inning off Brian Duensing. Yoenis Cespedes also drove in a pair of runs as he hit his 4th triple of the season. The Athletics begin a 3 game series with the Texas Rangers on Friday. The upcoming series with the Rangers is huge as the Athletics will have a chance to put even more distance between them and the Rangers. On Thursday afternoon Oakland Athletics rookie pitch Sonny Gray took to the mound and blanked the Houston Astros. The Athletics won by a score of 5-0 and Sonny pitched 8 innings of shutout ball en route to notching his 1st career MLB victory. Sonny was in command of his pitches as he allowed a mere 4 hits while striking out 9. This was Sonny’s 4th appearance for the Oakland Athletics and only his second career start. On the season he is 1-1 with a 1.00 era and has 20 strikeouts in 18 innings pitched. The 23 year old is a former #1 draft choice of the Oakland Athletics out of Vanderbilt College in the 2011 draft. Sonny was called up to the big leagues for the 1st time in July and made his 1st relief appearance on July 10th against the Pittsburgh Pirates. Sonny’s 1st big MLB start took place on August 10th versus the Toronto Blue Jays. In that game Sonny took the loss while only allowing 2 earned runs. The Nashville native was 10-7 with a 3.42 era in 20 games with the Sacramento RiverCats this year. Sonny was a PCL All-star selection and was chosen to start the game. However he could not because he was with Oakland at the time. Hopefully Thursday’s start is what we can come to expect from Sonny Gray throughout his career. He is a young arm and only going to get better. You know you are in the middle of a pennant race when your division rival claims a player you place on waivers not once, but twice in a two week span. It all started 2 weeks ago when the Oakland Athletics placed Adam Rosales on waivers and was subsequently claimed by the Texas Rangers. Four days ago the Oakland Athletics claimed their utility infielder back when the Texas Rangers placed Rosales on waivers. Rosales lasted all of one game with the Athletics when they DFA’d him once again this past Saturday to make room for top pitching prospect Sonny Gray. In a not-so-surprising move the Texas Rangers claimed Adam Rosales off waivers. How long will Rosales last with Texas? Only time will tell. My guess is that they will try to hold on to him for the next couple of weeks until the rosters expand. It’s clear that both teams see value in the man, because neither team wants the other to keep him. Who says baseball isn’t like a game of chess? Nevertheless we need to put a stop to the Adam Rosales abuse!